Son is what you would call a “taxi dancer. ” The term and profession first appeared in 1913. Support for Prohibition was gaining and cities all over America were shuttering bordellos and red light districts. To serve the demand for nightlife, San Francisco’s Barbary Coast neighborhood opened up a type of dance hall that came to be called a Barbary Coast dance hall, staffed by women who made a commission from every drink they encouraged male customers to buy. But when Prohibition became law, the halls began charging the men to dance with the women. The more time a customer spent dancing with a woman, the more he paid, like a taxicab, hence the name, taxi dancer. They reached their zenith in the 1920s and 1930s before starting to fall out of fashion at the end of World War II. However, a large, older female Vietnamese population that desires a steady supply of dance partners, and men who view dancing as a way to make money and have fun at the same time, are keeping Son and his profession alive and kicking in Vietnam. 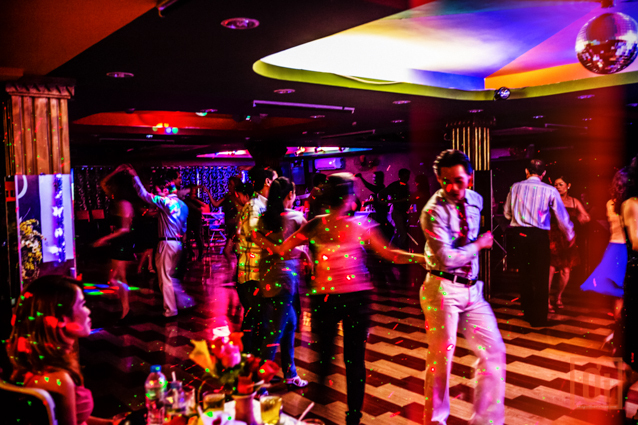 According to Giang, who manages several similar dance halls in Ho Chi Minh City, there are two clubs in town that offer female taxi dancers, but the rest offer male dancers for female clientele. The majority of them are located in Districts 1 and 3, numbering 15 in total. Ngoc and Dung, two friends in their 30s, have similar motivations. Ngoc, who was introduced to the scene by Dung, has been going to these clubs for two years. She goes to see her friends and enjoys dancing for exercise as well as socializing. She also hopes to find a boyfriend in the process. “After I got divorced I decided to start going out again and I found Café Phi Truong,” says Dung, a veteran clubber. “I got to socialize, exercise, and after being (divorced) I got to look for a new boyfriend. ” She goes dancing every night of the week and almost always goes here. “Occasionally I’ll go to a different club when this one is hosting a birthday party or other event that I’m not interested in attending. otherwise, this is my club. And I always dance with the same two dancers, or I don’t dance. ” Dung adds that she even supports the dancers and has them living under her roof. Protocol is straightforward at these clubs. Café Phi Truong’s customers pay VND40,000 for entry, VND45,000 on weekends and “It’s much better money than I would be making if I finished my degree and got a normal job. I love dancing and I’m out in these clubs 7 nights a week and I never dance for free” holidays. Hiring dancers costs VND200,000 for 3 dances. After the initial 3 dances, customers may buy single dances for VND50,000. Additionally, dancers are paid VND1 million per month to show up 5 nights a week. The average dancer earns VND10 million a month. Good dancers can earn much more. The love life of a dancer is often as unconventional as the job. “Many dancers have girlfriends, ” explains Son. “But they often get jealous because we always have lots of women competing for our time. ” He keeps it simple by staying single, and mixing business with pleasure. Other stories from Giang include housewives who sneak off to clubs that operate both day and night. Under the guise of going shopping they would head to a club, change into a dress hidden in their bags, do their hair and makeup in the bathroom then dance for an hour or two. And right before it’s time to head home, they rush to the market to fill up some grocery bags. In some instances, the women go shopping prior to going to her club and pay one of the cleaning women there to watch their groceries while they dance. She also sees many women playing hooky from work or simply sneaking around behind their husbands’ backs.